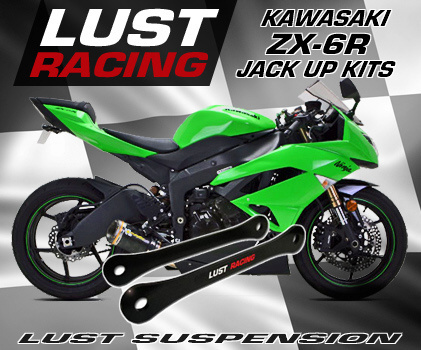 Kawasaki ZX6R jack up kit from Lust Racing. Improves front end feel and steering response. Your Kawasaki ZX6R will turn in easier in to bends and respond quicker to steering input. Lust Racing suspension links are made out of durable roll forged steel and finished in black powder coating for corrosion protection and long lasting finish. Please select the correct year model of your Kawasaki ZX6R when ordering.